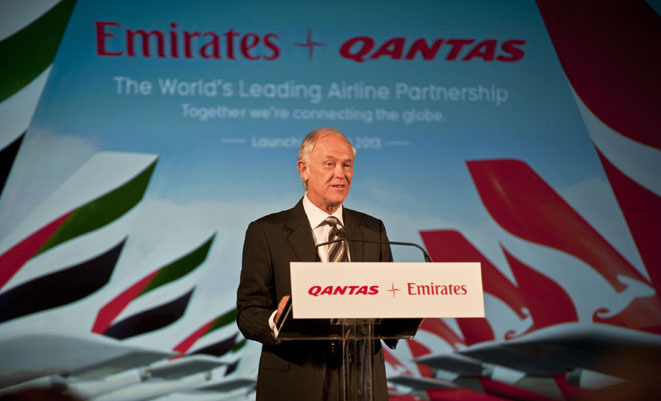 Emirates' Tim Clark speaks at the launch of the Qantas-Emirates alliance. Today’s announcement and signing of the historic alliance agreement between Qantas and Emirates represents a seismic shift in the dynamics of the Australian airline market, both from the customer and the airline business perspectives. At a quick glance today’s announcement appears both a win-win for Qantas as a business and for Qantas’s customers, and also an admission of defeat that Qantas today doesn’t offer the network reach and frequency that key competitors like Emirates, Cathay and Singapore do, to whom it has increasingly lost customers to, and hence revenue from, for many years. At one level this deal represents a further contraction of the Qantas international network, with the announcement that the airline is quitting flights to Frankfurt in its own right, leaving twice daily (one ex Melbourne, one ex Sydney) flights to London Heathrow via Dubai as the only services Qantas will operate to Europe in its own right. So from when the alliance is operational from next April, Qantas will operate just 14 flights a week between Australia and Europe, whereas Emirates will operate to Dubai 84 flights a week from five Australian cities. So if you buy a Qantas ticket to Europe for travel after next April, chances are you will be on an Emirates-operated flight part of the way – and that’s if you are in Melbourne or Sydney. If you are in Brisbane, Adelaide and Perth you will – unless headed to London – be on an Emirates flight all the way. So it is an arrangement that on face value favours Emirates more than Qantas. But on the other hand this alliance now offers a much more compelling customer proposition for Qantas passengers. Today Qantas operates flights in its own right or under codeshare deals to five European cities. From April with the Emirates partnership that will leap to 33. That’s a sixfold increase in network reach, while the customer proposition is far improved with one-stop flights to all those 33 points via Dubai, rather than two-stop flights over London Heathrow for connections on BA back into continental Europe. The Emirates-Qantas link-up provides a pretty compelling customer proposition for flights to Europe. The other good news for Qantas passengers is that the Emirates alliance will allow Qantas to much better focus its services to Asia, in particular to Singapore, now that those flights won’t be optimised for a hub operation for connections through to Europe. Presumably this will mean the return of a daylight flight from Sydney to Singapore, for example. But to be truly competitive with the Asian giants like Cathay and Singapore, Qantas will need to offer not only more convenient flight times, but frequency. But frequency will be hard to maintain with no through traffic to Europe to boost traffic volumes. Then there is the competitive aspect. The Qantas-Emirates deal one-ups the Virgin Australia-Eithad deal, which sees Virgin Australia and Etihad codeshare over flights through Abu Dhabi. That pairing offers 27 weekly services between Australia and Abu Dhabi (three per week of which operated by Virgin, the rest by Etihad) with onward connections to 14 destinations in the UK and Europe. The Emirates-Qantas deal is of an order of magnitude much larger. For too many years Qantas International has contracted in the face of aggressive competitors like Emirates and Cathay who, with their benefit of geographically favourable hubs, have built networks on the premise of taking passengers where they want to fly, when they want to fly, while on the other hand Qantas has rationalised down and aggregated its services through hubs that best fill its aircraft rather than offering the best customer service proposition. So this deal with Emirates, and the renewed focus it allows on Asia, should change that nexus and be a huge boon for Qantas customers. It’s a huge boon too for the Qantas Frequent Flyer scheme, given reciprocal ‘earn and burn’ rights across the two airlines. All those Qantas Frequent Flyer members who today fly on Emirates would be brought back into the Qantas fold, bolstering the value of the scheme no end. There would be both revenue costs and benefits to the frequent flyer tie-up, but it will be a huge competitive boost against Virgin Australia’s own growing scheme (remembering that Qantas Frequent Flyer is one of the most profitable parts of the business). Suddenly Qantas seems to have stopped the rot in its international network, and the prospect of a Emirates tie-up to cover Europe, and optimised Asian network, a muscled up (thanks to Emirates again) trans-Tasman offering, and a robust Americas network hubbing through LAX, DFW and Santiago sounds a viable proposition for the competitive market that Qantas finds itself in. So it seems a good deal for Qantas. But imagine for a moment how different Qantas would look today if it had come to an arrangement with Emirates years ago to codeshare and hub over Dubai. 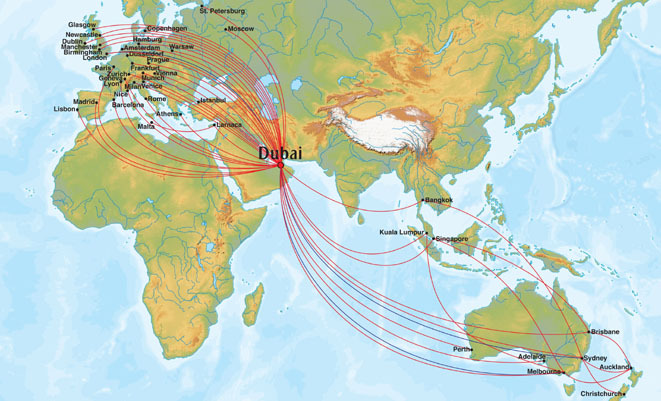 Far more of those combined 98 flights a week to Dubai (and onwards to points in Europe, the Middle East and North Africa) would have been operated by Qantas red tailed aircraft. But better late than never. For if you can’t beat them, join them. The point not mentioned is that the only aircraft that can make a decent fist of SYD or MEL/DXB non stop are the A380 and for a smaller payload, the 777ER. Therefore the dynamics were not available years ago. Makes sense. If you’re going to use long range aircraft, you might as well use them over a greater distance. That may well be a possibility if QF and EK are smart about they use the considerable rights Australian carriers have to many European nations. EK could gain some valuable extra flights to restricted places like Germany by having QF operate the services with an EK code slapped on. This whole alliance is huge news for Qantas and I feel only the beginning of a revitalised and thoroughly international Qantas of the future. Excellent point Tom, Alan Joyce was talking today about flying 787-9s over Dubai to European ports. Its a deal which I hope works out for all. I note about B787-9s to European ports, but what colours, silver and orange one would think not white with red tail. We shall see what Mr Joyce and co do with these new aircraft when they finally get here. 4th Sept 2012, Flight EK 412 Dubai to Sydney flight did a mystery turn around, jettisoned fuel and returned to Dubai. With passengers stranded at Dubai for over 10 hours, with no explanation. Here is something that nobody has had much to say about …. MAS starting in Oneworld, sponsored by Qantas. Maybe there is an alternate hub in the plans for Asia with KL? This subject has slipped off the radar for a while. Actually, Dubai has very little oil.The Emir of Dubai(Maktoum ) is a very smart man. He aritchected the whole thing 25 years ago to plan for “non oil” based industry. Dubai has the 2nd largest port in the world after Singapore. Their economy is main based on trade and commission. They have also started last year a financial hub and plan to become the wall street of the middle east. They also have a huge duty free system. It is not all oil. Mohammed Maktoum is the brains behind all this. He is following Lee’s philosophy (Founder of Singapore).